President Barack Obama announced his administration is giving $80 million to help repairs Flint’s water infrastructure and make the drinking water safe, calling the situation “inexcusable.” The head of Michigan’s Environmental Protection Agency resigned. BREAKING: CBS announces Pres Obama has increased water aid to Flint from $5 million to $80 million. Thanks to all who've signed my petition. Obama said the money would come from the recent bipartisan budget allocated to help cities build water infrastructure, and would be separate from the $5 million already allocated to the state through an emergency declaration Obama made on Saturday. The allocation is also separate from the money sought by Michigan Governor Rick Snyder in his appeal letter to the president on Wednesday, asking Obama to reconsider on his lack of support for major disaster relief. “It was encouraging to hear President Obama say that $80 million will be coming to Michigan to help local governments, like the City of Flint, improve their water systems,” Flint Mayor Karen Weaver said in a statement from Washington, DC, according to the Detroit News. Michigan’s Legislature is fast-tracking $28 million in state funds, which are intended to buy more bottled water and filters. The money is also supposed to be used to back health and educational services for children with elevated levels of lead in their blood. Meanwhile, the regional head of the Environmental Protection Agency (EPA) for Michigan, Susan Hedman, announced her resignation on Thursday. She has been accused of not doing enough to prevent the contaminated water crisis. Hedman told the Detroit News last week that her office knew in April 2015 that Flint’s decision to switch to the Flint River for its water supply “could increase pipe corrosion and spiked lead levels.” She did not take any public action, instead choosing to try and pressure Michigan officials to address the situation internally. Dan Wyant, director of Michigan’s Department of Environmental Quality, already resigned in December for his role in the crisis. Emails released by Governor Snyder on Wednesday showed that his staff and the environmental agency spent months last year pointing fingers at local and federal offices for the lead problem as they downplayed concerns. The EPA also sent a letter to Snyder Thursday officially declaring that Flint is violating federal drinking water rules, and must work quickly to fix them. EPA head Gina McCarthy said the agency “is deeply concerned by continuing delays and lack of transparency and has determined that the actions required by the order … are essential to ensuring the safe operation of Flint’s drinking water system and the protection of public health,” according to the Hill. 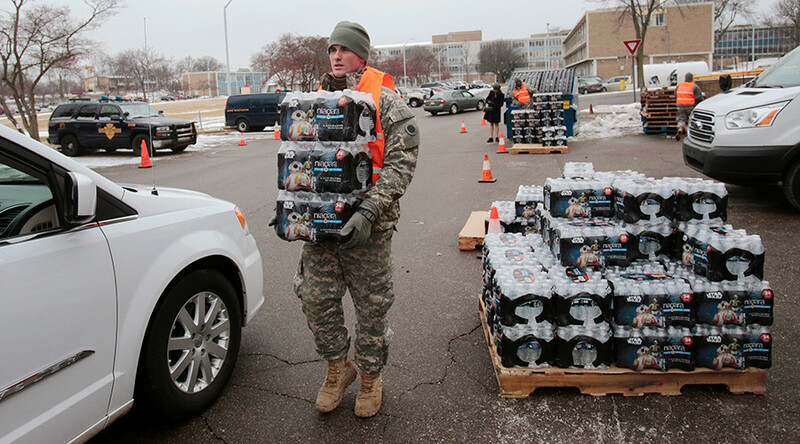 The problem with Flint’s water began in April 2014, when the city switched from Detroit’s water supply to water from the Flint River in a cost-cutting measure. Despite the water having high salt content, it was piped untreated into homes and offices. The salt corroded the lead in the pipes, causing the water to become contaminated. Residents then began complaining about dirty water with a bad smell and taste, as high lead levels started appearing in the blood samples of children. The city switched back to Detroit’s water supply in October, but only after months of complaints and protest from residents, who were angry that the government had ignored alarms raised by doctors and scientists. Lead contamination can cause brain damage and other health problems.